Help contribute to CRG Research! CRG is actively researching many first-generation Camaro configuration, production, and restoration topics. We are soliciting information from our web site readers on the specific topics below. If you would like to contribute data on any of these specific research topics, please send an email to the contact listed. Note that we do not release, without permission, owner-submitted data that can be traced back to a specific vehicle or owner. The CRG email contact for the following topics is . Data on early 1968 08B built LA Camaros that have a suffix after the trim tag interior code (like the 1967s). Data on any 1967 Camaro (or Firebird) with a bench seat with headrests. Information on 67-69 Camaros from non-US assembly plants (especially South America and Europe). Original axle codes as a function of application. 1967 LOS use of the chrome oil filler tube. The CRG email contact for the following topic is . N44 steering (with or without N40 power assist) with original documentation to back it up. Needs include casting numbers, pictures of steering components and details such as how many turns lock-to-lock. 10-bolt rear axles in original SS cars, and 12-bolt rear axles in 6-cylinder and non-SS, non-Z28, non-L30/M20 cars. Special Paint cars. We would like to find more examples of cars that received special painting and/or striping instructions. These would include special stripe colors, special body colors, special stripe styles, and stripe delete. L30/M20 - We are following changes made to the L30/M20 model (327/275HP engine with 4-speed). Sometime near the same period that the radius rod was introduced (December 1966), the L30/M20 axle was upgraded from a 10-bolt to a 12-bolt. We urge anyone with a L30/M20, especially a December- or January-built 1967 model, to submit his or her data to the CRG. Seat belt clips on console: The clips were added in March, but usage appears intermittent through April. Metal vs. plastic seat backs: Transition appears to occur during mid-April or possibly first week of May. Quarter panel styles: There appear to be 3 types of 1967 quarter panels that are distinguished by appearance in the door jamb area. The "early style" jamb includes a stamped indentation, in the shape of a conventional telephone handset, surrounding the door latch pin. The "middle style" includes this "telephone" shaped impression, but adds to it 5 small indentations that are in a vertical column near the leading edge of the jamb. The "late style" jamb is like the "middle style", including the 5 vertical indentations, but the top portion of the telephone-shape impression is partially truncated. The early-to-mid transition occurs around November/December. The mid-to-late transition seems to be in March/April. 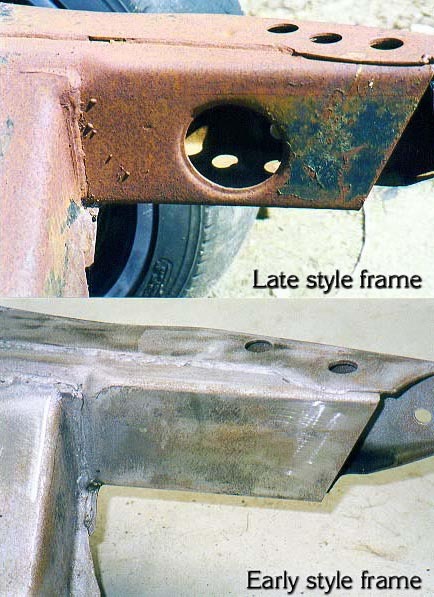 Subframe style: A mid-year change was instituted for 67 Camaro subframes. Large holes (about 3-inch dia.) were placed on the inside surface of each front frame "horn" to provide access to bumper bracket nuts. 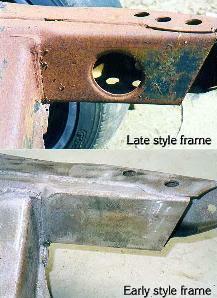 The earlier frames used a slot in the outer surface of the frame horn to hold a J-nut (clip nut) for the bumper bracketry. The transition period for this change appears be circa November/December of 1966; we are attempting to gather more data to further refine the implementation date. An interesting note is that some frames have been found with the large hole on one frame rail and none on the other rail. Apparently such frames were built during the transition period from one style to the other, while making use of all existing frame stock. If you have a Camaro built from October to December of 1966, we would appreciate your car data, via the CRG Forum, including a note on which frame style you have. Elimination of the Astro-Ventilation logo on door glass. We would like to further refine when this change occurred. When did power drum brake booster change from 0749 to 9079 (about December 67 or Jan 68)? When did 396 block casting change from '323 to '440? When did 396/375 intake manifold change from '069 to '163? Did rear spiral shocks for multi-leafs change? Assembly manual indicates that they did. Woodgrain ashtray. 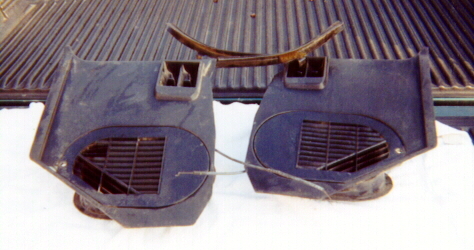 Starting around April of 1968, the ashtray front was changed from black to woodgrain when the surrounding molding was woodgrain (Z87, Z23, or D55). SS stripe. Transition from bumble bee to later stripe that runs down the door. Brake proportioning valve supposedly changes during 1968 from the small 1967 style to the larger 1969 style. Transition from early style quarter panel which did not have Astro-Ventilation plastic grill to later quarter panel which did. November cars had early style. Phase-in of the 2nd design 1968 front spoiler (May?). 1967 mid-year change in style of the D91 stripe from the early wrap-around version to the truncated style used in 1968. A GM bulletin describes a test fleet of late 1968 model year vehicles of various types that were used to evaluatedevelopment builds of the THM350 3-speed transmission that was introduced for the 1969 model year. These vehicles were then sold to the public following their evaluation. There were late 1968 model Camaros included in this fleet, specifically L30 327ci/275HP powered Camaros specially fitted with the THM350. CRG would appreciate any data on any of these test fleet cars, Camaro or otherwise. Phase-in of the "yellow-light" stereo system in 1969 (June?). Phase-in of the 1-piece 1969 kick-panels (January / February timeframe). Phase-out of the D96 fender striping on 1969 Z28s with Z21 or Z22 (February?). On 1969 big block THM400 cars, a fast-idle solenoid appears to have been used on some cars, but not others. We would like to understand why.